PUNE, India - Feb. 11, 2019 - PRLog -- Vendor management software is useful for efficient delivery of contracted products and services. It helps the organizations to control cost with excellence services. 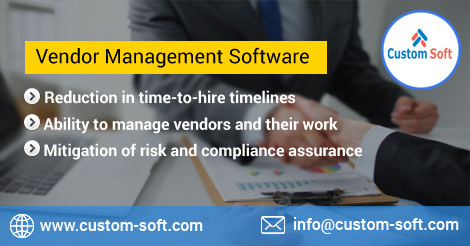 This vendor management software is developed by CustomSoft which helps organizations to develop, manage and control contracts with vendors. This also helps the organizations to meet their business objectives. CustomSoft is Software Development organization in India having expertise in customized software development for international clients from U.S.A, U.K. Canada, Australia, South Africa, New Zealand, and Dubai etc. CustomSoft develops software for ERP, CRM, SCM, CMS domains.